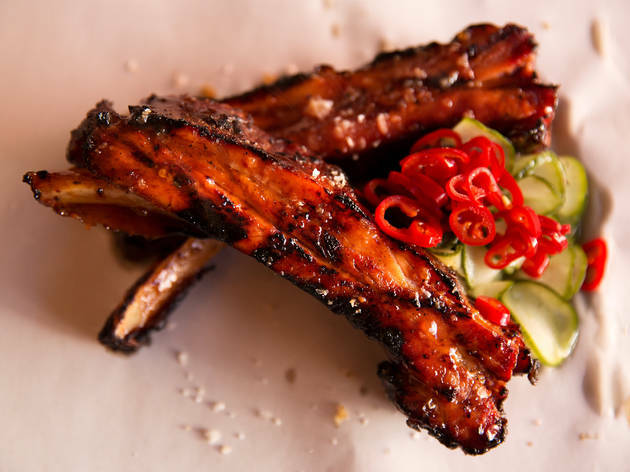 Please note, Smokestak has now left Dinerama to open a permanent restaurant. Time Out Food & Drink Editors, January 2017. If you went into a coma in 1985 and woke up yesterday, one of the first changes you’d notice would be meat on the street. 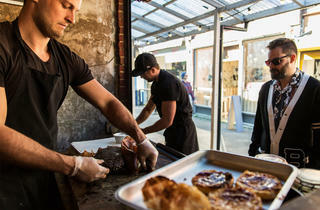 Street food has grown so much it might have been dosed with steroids. And heavily meat-based street cooking has led the way. 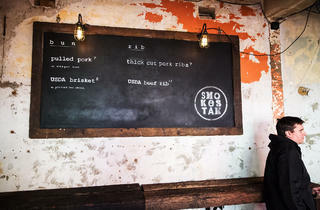 Smokestak is one of the beneficiaries of this change in London’s dining culture, and one of its out-and-out stars. Meat may be everywhere, but few places – indoors or out – do it as well as Smokestak. Many meat specialists make a USP out of TTHS – Try Too Hard Seasoning. They layer on the kimchee, the jalapeños, the harissa or the fruity sauce. Don’t get me wrong: the pile-it-high approach can yield great food. But it’s much more impressive when a chef bases his or her cooking on buying great ingredients and then doing as little as possible to them. 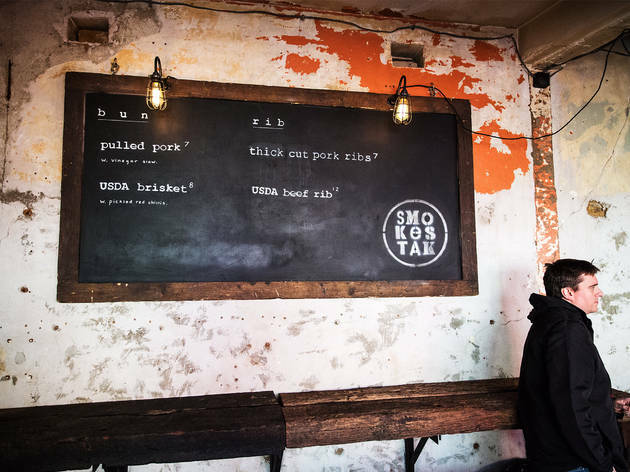 That’s the idea behind Smokestak, a star of the street-food scene at Dalston and elsewhere. It sells brisket and spare ribs, and pulled pork sandwiches too. But the star turn is beef rib, the most expensive item on the menu at £12. This is USDA prime beef, melt-in-mouth tender, seasoned with a beautifully balanced spice rub so good it’s a crime to put barbecue sauce on it. 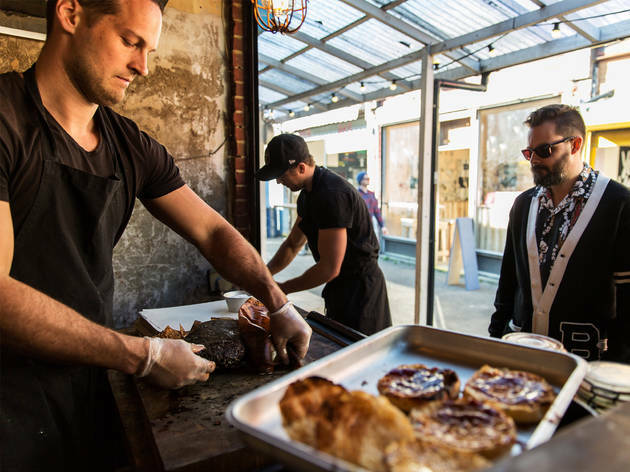 Smokestak finishes ribs and brisket on the grill, adding sauce as they cook. If you’re taking it home, ask for no grilling and no sauce, and heat it very briefly in the microwave. And even if you’re eating it there, you can ask them to hold the sauce. 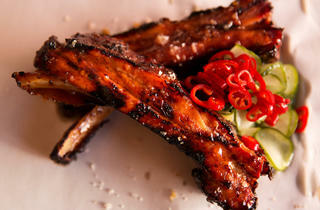 This will give you major meat-street-cred in the eyes of the grillmaster, who may be Mr Smokestak himself, David Carter. He started the business in 2013 after working front of house for Gordon Ramsay and Roka, among other gigs. It took months of travelling and studying in the USA (‘around 4,000 miles’) before he ‘really nailed it’. Watching Carter at work is not that different from watching a great sushi chef: quiet and studious, he is totally absorbed in what he’s doing. There should be a sign over the stall saying: Quiet, Master at Work. Go to watch (and eat) at Dinerama Wednesday to Sunday, and Dalston Yard and Model Market (Lewisham) on Friday and Saturday. Tube: Old Street, Overground: Shoreditch High St.
I’ve been to Ssmokestak a few times now and I think I’ve tried everything on the menu… and I can safely say that every dish are just simply, delicious! One of my visits was an after meeting meal with guests from Korea. We needed to find somewhere really close to where we were, and with Koreans being big into their bbq, we thought, they would like Smokestak. When we made the booking we told them it was a casual work meal. They made sure we were really looked after from the moment we got there and through out the meal. Our guests absolutely loved all the dishes, and said it was one of the best meal they have had in East London! There are plenty of reviews here so I think people get a pretty good image of what the bbq meats are like. But for me – the rarebit jacket potato and the crispy ox cheek – I can happily go there just for them. From the actual meat dishes to all the sides; from the décor, atmosphere to service – all pretty flawless. I am not usually one for having the same thing more than once at places like Dinerama but for Smokestak I have to make an exception. I think I've had it about 5 times! The meat is cooked to perfection every time...and now they are opening a permanent residency?! That tells you all you need to know! While queuing the amazing aromas coming from the kitchen started filling my head and the mouth quickly started watering. when my time time came I choose to go for the ''Pulled Pork Bun', waited a few more minutes more and finally it was mine, it looked good and it tasted even better. I've tried many things that night and this one was easily my 2nd favorite of the night. 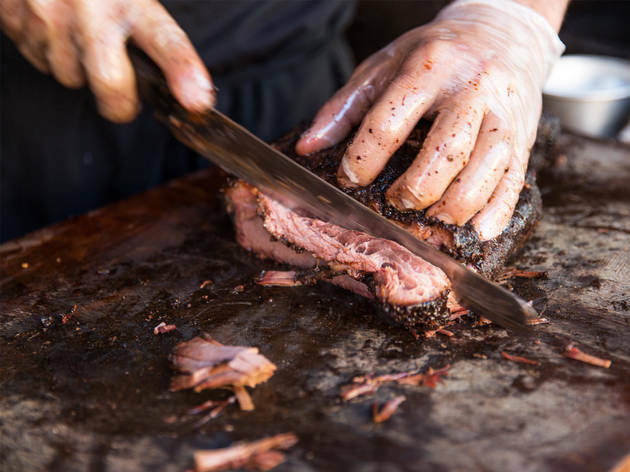 The most delicious brisket in town. 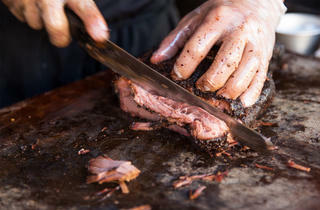 I tried them at the Street Feast Dalston Yard and do still have dreams of this brisket. 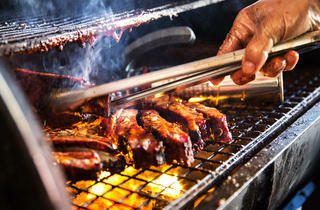 Having tried Smokestak for the first time at Street Freast's Lewisham Model Market, I fell in Love. They are by far and away the best ribs I've ever had and it worth going to the Model Market or any event where they are just for them. The smell, let alone the look, is enough to make you drawl; even my partner who is cant eat them due to the tomato in the BBQ sauce stairs at them wistfully. When it comes to which ribs to order - the USDA Beef (£12) or the pork (£8) - it is hard to know which and frankly just order both and share with someone and fall in love with them. I cant say I would agree with Time Outs price guide as while I would agree that £8 for 4 pork ribs is good value, when last there I only got 2 and they were no different in size, and the beef rib was one large one for the £12. You can see the difference in my photos the first had the beef on the left and one of the pork on the right, while the second photo is the 4 pork ribs from the first time I had them. Either way you should go and have them, you wont be disappointed. 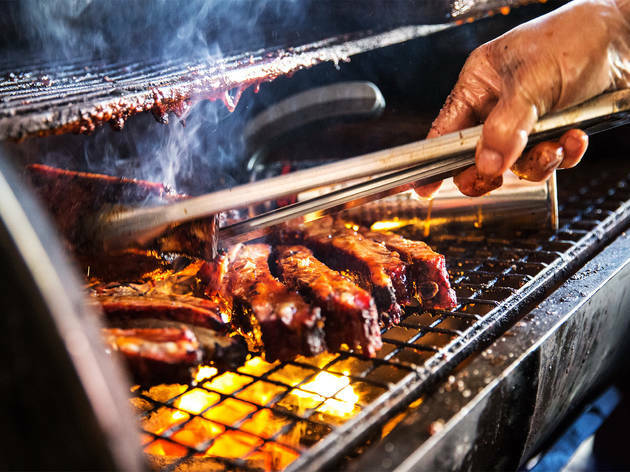 I tried out Smokestak for the first time at Street Feast and was not disappointed with them. I'd heard so much about them and read all the reviews, and they totally live up to them. This BBQ is on par with not only some of the best I've had in London, but also the BBQ I've had in Texas. Between our group of friends we tried mostly everything on the menu and it was all great, especially the ribs (see the pic!). Well worth visiting, and the fries are also excellent! Really great food served over a flaming grill - what's not to love? The ribs and brisket are both killer and I've always been happy to queue for them. Not a great first date idea as it's incredibly messy, but once you've gotten over that precious first stage of your relationship, this is a great test of your partner's carnivorousness! Not a destination spot IMO but well worth it if you're hungry and it's in your eye-line.